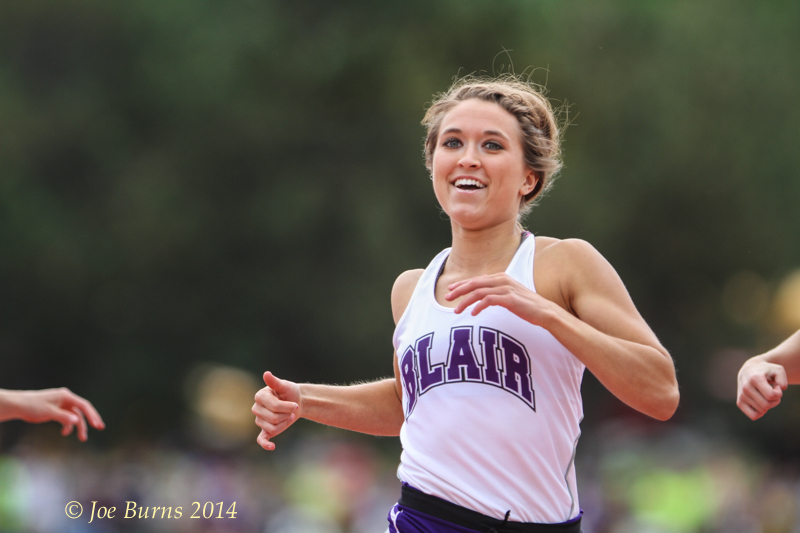 Morgan Anderson was all smiles as she crossed the finish line with state title in the Class B 100-meters final. Burke High School in Omaha has been the site of the Nebraska State Track and Field Championships for 42 years, and I have attended around 40 of them as a worker, coach, or photographer. I always look forward to the color and spectacle as well as the outstanding individual and team efforts. As a long-time Benson High School teacher, I still root for the Bunnies, but my passion now is to capture the energy and emotion of the Blair, Fort Calhoun, and Arlington athletic programs. 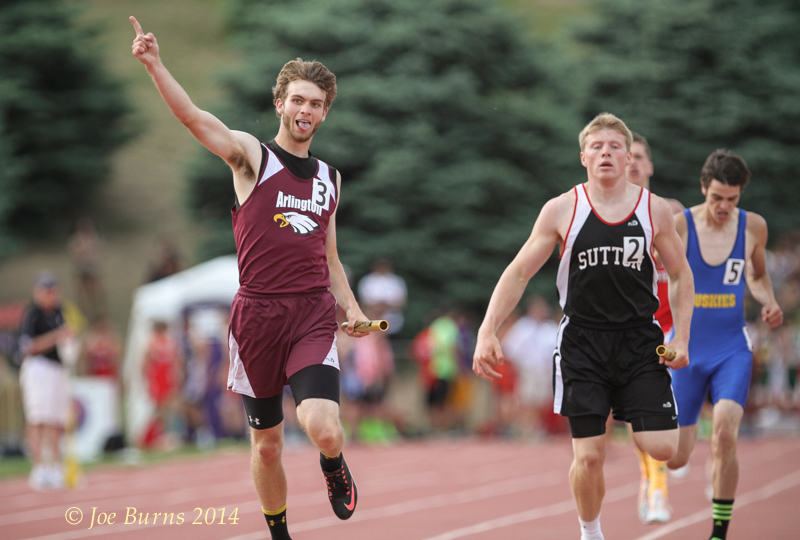 Arlington’s Tyler Simpson celebrates finishing first in the anchor leg of the AHS boys 4-400 relay team. 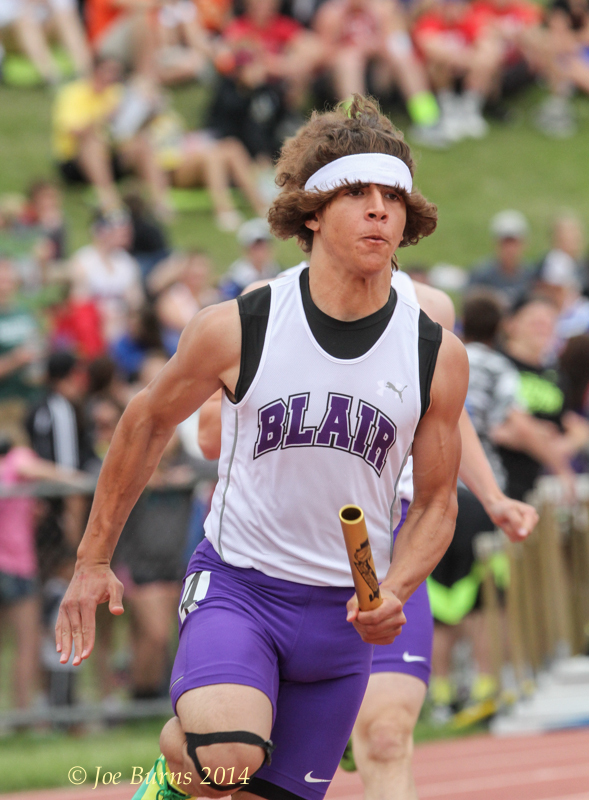 Pitmon Foxall running the final leg of the Class B boys 4X100. Foxall won the class B boys high jump title. Don Dibben gives daughter Molly Dibben a hug and support following the class B Girls 4-by-400 relay. The Blair girls placed fourth in the state competition. Fort Calhoun’s Alex Tietz places fourth in class B 1600 run. Morgan Anderson wins her 100 preliminary heat. Jayme Anderson, girls 400 prelinaries. Shannen Jennings, class B 1600 relay. Shannen Jennings class B 400 preliminaries. Sara Olsen placed third in giirls class B shot put. J.C. Grossoehme takes off at the start of the Class B 4-by-400 relay. Nolan Kirwan, Class B 3200 relay. 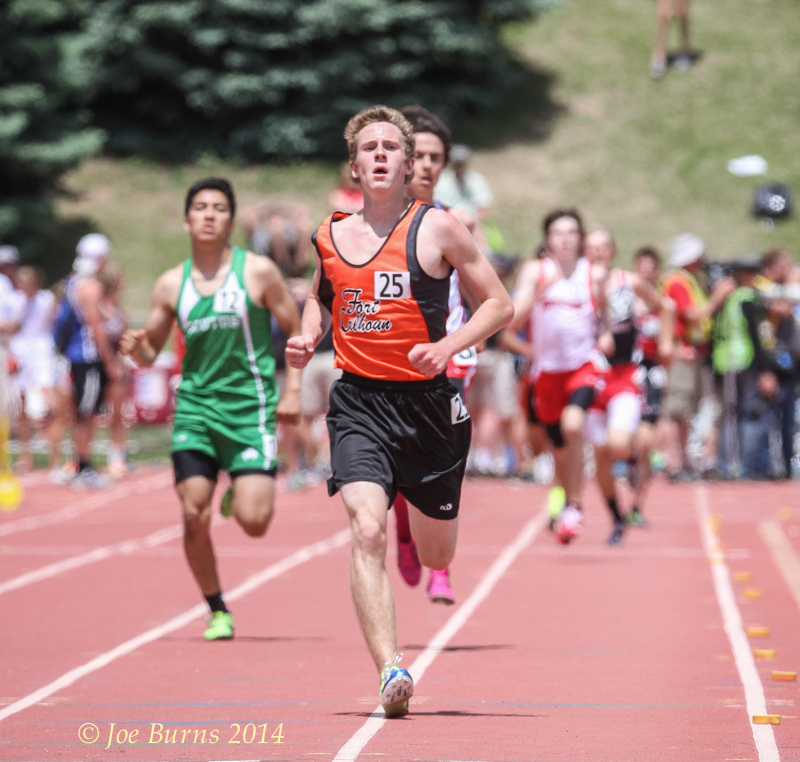 Aaron McKinnis, Class B 3200 relay. Matt Brunkhorst, boys 3200 relay. Ian Mertlic competing in the 300 hurdles. Nick Gaffney competes in class C discuss. Grace Whitlaw comptes in Class B high jump. Evan Wick competing in the Class B 3200. Evan Wick, Alex Tietz, and Alec Wick after the first lap of the Class B 3200. Ericka Clark clears 9 feet in the Class B pole vault. Taylor Stewart finishes 8th in the Class B pole vault. Pitmon Foxal runs the final leg of the Class B 800 relay.